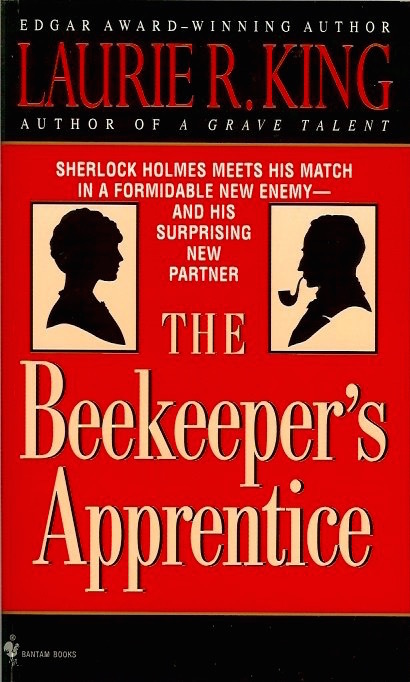 The Beekeeper's Apprentice or On The Segregation of the Queen by Laurie R. King is another Holmes pastiche I think would make a great movie or TV miniseries. Originally published in hardcover in 1994, this Batman paperback is from 1996. In 1915, long since retired from his observations of criminal humanity, Sherlock Holmes is engaged in a reclusive study of honeybee behavior on the Sussex Downs. Never did he think to meet an intellect to match his own–until his acquaintance with Miss Mary Russell, a very modern fifteen-year-old whose mental acuity is equaled only by her audacity, tenacity, and penchant for trousers and cloth caps, unthinkable in any young lady of Holmes's own generation. Under Holmes's sardonic tutelage, Russell hones her talent for deduction, disguises, and danger; in the chilling case of a landowner's mysterious fever, and in the kidnapping of an American senator's daughter in the wilds of Wales. But her ultimate challenge is yet to come. A near-fatal bomb on her doorstep–and another on Holmes's–send the two sleuths on the trail of a murderer whose machinations scatter meaningless clues and seem utterly without motive. The villain's objective, however, is quite unequivocal: to end Russell and Holmes's partnership–and then their lives.